Movies have taught us to gush over the size of the diamond on our finger. But it all sounds too passe now. 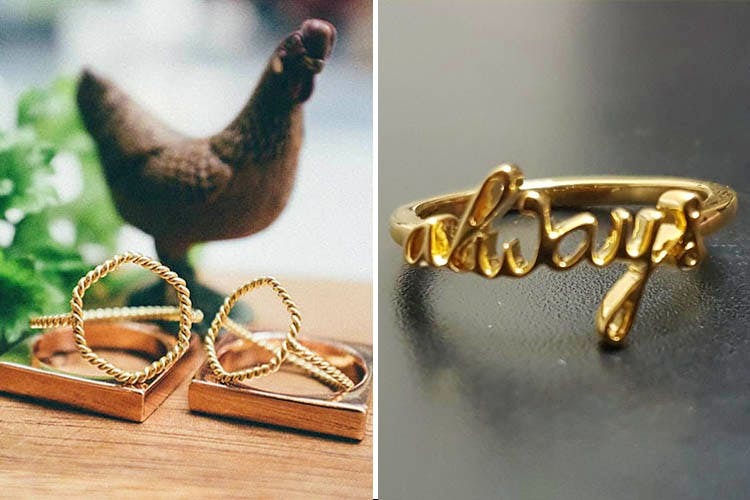 If you too, agree, check out these cool, quirky rings instead. This Lotus ring from Jaipur Gems has our vote for the intricate detailing. Made out of 18k rose gold with a pink spinnel and pink diamonds, the band boasts of white diamonds. The lotus has been hand-painted. It will surely put a smile on any nature lover’s face. This minimal hexagon ring is light, different and definitely quirky. Designed by Rishi Pherwani from Argentum Jewels on Turner Road in Bandra, it is definitely for those who steer clear of bling. Made out of 14k gold, it is a minimalist’s dream. With a 13-diamond setting to flaunt, the baguette ring has our heart with the sheer grace it exudes. Made out of 0.90 carat diamonds, it is perfect for people who like chunky jewellery. It definitely makes a statement, we say. Executed by Raunak Singhvi of Sundar Jewellers in Udaipur, this Harry Potter-themed ring has been made with 22 carat gold. This ring that said ‘Always’ was made for Ishita Dave, a Harry Potter fan along with Ayush Jain, her fiance.